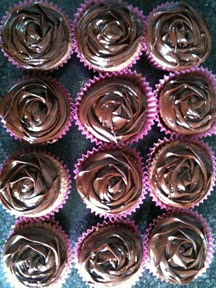 Sarah's Kitchen Diary...: Guest baker - Cupcake Heaven! 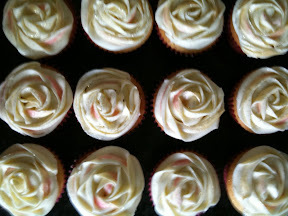 For my 10th ever post I thought I would write about a guest baker to Sarah's kitchen. My sister Helen took over the kitchen to make some cupcakes and I might be a little bias but I think they are pretty amazing. The first cupcakes she made were for a friends birthday. They vanilla cupcakes but decorated in the style of ombré using plenty of red food dye, the theme of the party (for anyone who doesn't know ombré hair is very fashionable at the moment and basically means a graduation of colour so perhaps dark roots fading to blonde ends). 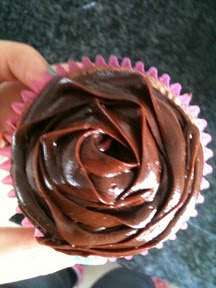 The icing was piped using a Wilton 2D nozzle from the centre outward. 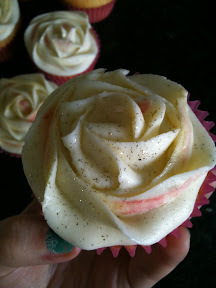 For anyone who wants icing tips You Tube has loads of how to videos. 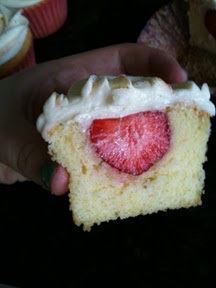 The recipe was just a simple sponge and butter icing but if anyone wants it let me know. 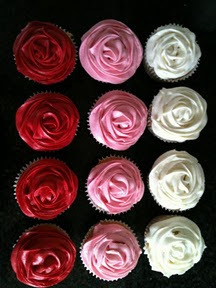 She then moved on to make two sets of cupcakes for an afternoon tea and to take to work with her. The first was again a vanilla cupcake but this time she removed some of the centre of the sponge and hid a whole strawberry under the icing and decorated it with edible glitter and edible lustre. Finally she made a dense chocolate sponge using hound almonds for extra moisture and decorated them with chocolate ganache. Again both of these were piped using the Wilton 2D nozzle.